This vertical climber with adjustable height is a all body workout machine that mimics the movements of rock climbing to burn calories, build endurance and work all of your major muscles. More calories could burn compared with other simple fitness equipment. With the heavy duty material, the largest capacity is up to 265 lbs . It is not only suitable for gym, but it also can be used at home, office and other places. Good climbing machine for simple exercise and don't hesitate to buy it. [Durable Steel Construction]- This climbing machine is made of heavy duty steel tubing to ensure stability and sturdy when you exercise. The largest weight capacity is up to 265 lbs, which will meet most people's needs. 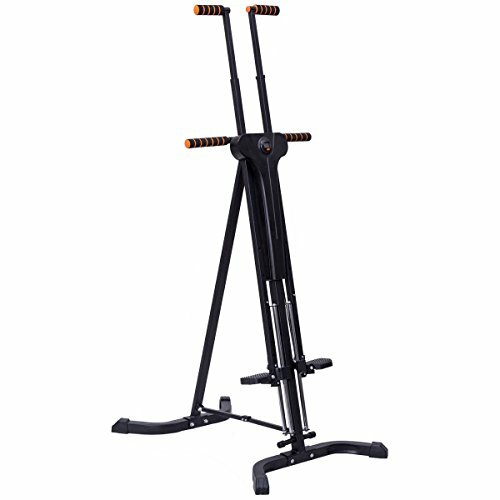 [Adjustable Height and Soft Handle]- This climber offers different adjustable height to ensure you get the all-round various upper and lower body workouts. With this adjustable design, it is also safe to prevent injury for beginners. It is equipped with the soft handle, which make you comfortable when exercise. [All-body Exercise]- You can exercise your arms, abs and legs when use it. It performs good for all-body exercise. More calories could burn compared with other simple fitness equipment. It will be a good trainer for you to exercise effectively within a short time. [LED Display]- The informative LED training computer circularly shows time, distance and calories burned during your exercise. It can ensure you stay focused when your workout, which is very convenient during your exercise. [Suitable for Different Places]- Clear and brief instruction make it much easier to put together. And it can be folded up when you don't use it. It is not only suitable for gym, but it also can be used at home, office and other places.